Fleet, Utility Truck & Van Repair You Can Count On…. 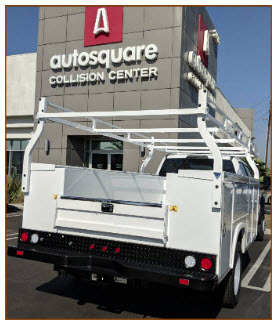 Autosquare Collision Center is one of the few body shops that specialize in the repair of all types of fleet vehicles, including work trucks and vans with Harbor, Royal Truck Body and other utility truck body styles. We understand how important it is to get your company car, work truck or van back on the road as soon as possible and we have a highly experienced team to estimators, repair and refinish technicians that can do just that. You can Make an Appointment for an estimate right here online. Don’t send your utility truck or van to just any body shop, bring it to Autosquare Collision Center where you’ll get truck and van repairs you can count on.